Chief Ade Ojo obtained a B.Sc. in Business Administration from the University of Nigeria, Nsukka (UNN) and has attended various top Management Development Courses including the Chief Executives’ Programme of the Lagos Business School (CEP-7) and the IESE/LBS Seminar on Competitive Strategy and Value Creation in Barcelona, Spain. 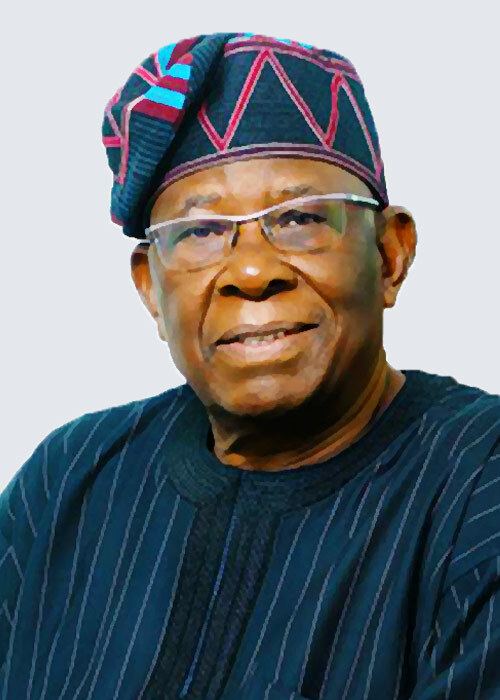 He was honoured with the Doctor of Business Administration (DBA) Honoris Causa by the University of Nigeria, Nsukka and holds the Nnamdi Azikwe Distinction Award for Excellence. He is a Fellow of the National Institute of Marketing of Nigeria and Institute of Directors (IoD). He is also recipient of the National honour of Officer of the Order of the Niger (OON) and holds the traditional title of Aare Asiwaju of Ilara Mokin. He is the Chairman/Founder of Elizade Nigeria Limited and an industrialist of high repute. He chairs several Boards cutting across several industries including Toyota Nigeria Limited, Moore House Sofitel Limited, Courteville Investments Plc and Custodian & Allied Insurance Company Limited.